Cashback Reward : Earn up to 44$! TransScript All-in-One First-Strand cDNA Synthesis SuperMix for qPCR provides all the necessary components for cDNA synthesis from total RNA or mRNA. It is provided at 5x concentration and used at 1x concentration by adding gDNA remover, RNA and H2O. Simultaneous genomic DNA removal and cDNA synthesis are performed in one tube. 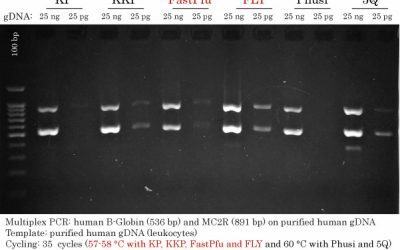 After cDNA synthesis, gDNA remover and reverse transcriptase are inactivated by heating at 85°C for 5 seconds. The resulting cDNA are suitable for qPCR and not for regular PCR. Simultaneous genomic DNA removal and cDNA synthesis in one tube. The optimal ratio of oligo(dT)18 primer to random primer(N9) for qPCR ready cDNA. qPCR ready cDNA in 15 minutes. User review from Goodman Cancer Center, Mcgill University, Montréal, december 06, 2017. The all in one kit was as effective as other cDNA synthesis kits we have used in the past with the additional benefit of all components in a ready to use master mix, and requires a thermocycler program with a far shorter duration. je suis prête à essayer ton kit de T7 pour voir s’il fonctionne bien. 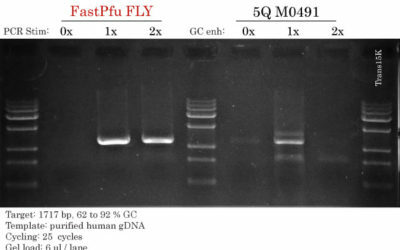 Je vais aussi acheter ta Transcript All-in-one first strand cDNA… (TGAT341-01) je l’ai essayée et elle marche bien (dans mon cas mieux que la RevertAid de fisher).